Despite international protection, great white sharks face several threats. These include reduction of their food supply, pollution, baited hooks and lethal gill nets used as beach protection measures. The cryptic nature of white sharks makes them challenging to study. And it is difficult to protect a species we don’t know much about. But new research has now added another piece of the puzzle towards understanding these creatures. Research on the DNA of white sharks around the South African coastline shows that the population has extremely low genetic diversity. This finding holds serious implications for their survival and more analysis is being done to try and understand this unexpected outcome and predict its consequences for the future of the species. Genetic diversity is an important indicator of the health status of a population in the wild: the higher the diversity, the easier it is for a species to survive diseases or unexpected changes in the environment. Among genetically different individuals there will always be those able to adapt and contribute to the next generation. A different scenario emerges when all the individuals share the same genetic information since depression by inbreeding and the loss of ability to adjust to environmental changes can quickly lead a species to extinction. We found only four maternally inherited lineages in the South African great white population, with 89% of all the sharks sharing the exact same lineage. Both mitochondrial and microsatellites data sets showed a remarkably low level of genetic diversity. The data on the mitochondrial DNA suggests that great whites off South Africa’s coastline have the lowest genetic diversity of any white shark population in the world. Even lower than the Black Sea’s endangered bottlenose dolphin when compared with other marine species. the result of a severe bottleneck: a sharp reduction in the population size due to environmental factors. historical local extinction: when a population ceases to exist in the chosen geographic area of study but still exists elsewhere. extinction/re-colonization processes: this sees locally extinct species from a chosen geographic area return thanks to immigration. The analyses of DNA is an incredibly useful tool when dealing with an elusive species. Every historical migration and reduction or expansion of a population is kept as a record in the DNA. An analogy would be the way in which the captain of a ship keeps track of a ship movements in its logbook. In the DNA logbook several chapters can be studied. Some of them tell the ancient story of the female lineages – mitochondrial DNA. Some describe the most recent history of the population movements or even the family trees– microsatellite analyses. We performed both mitochondrial and microsatellite analyses on samples collected around the South Africa’s coastline. We sailed on a research catamaran for four years, attracting sharks, identifying them by taking pictures of their dorsal fins and collecting genetic samples. The DNA of the South African white sharks was then compared with the DNA of 58 white sharks worldwide from studies conducted elsewhere. 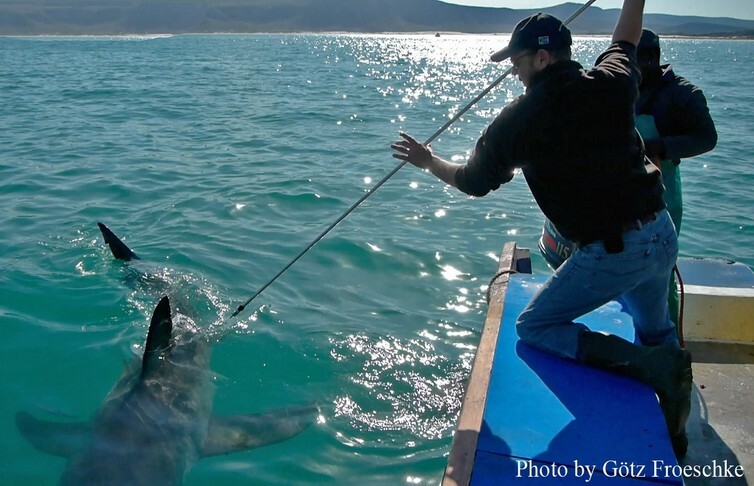 This helped us determine the genetic diversity and population distribution of the South African great whites compared with others across the world. 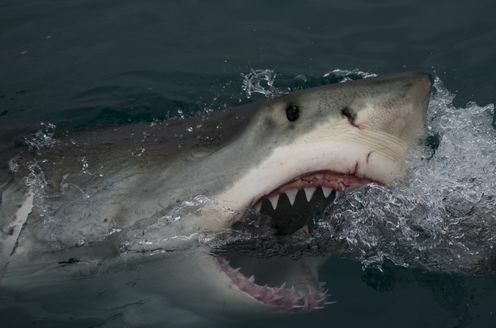 The study shows that South African white sharks belong to one interbreeding population. Some of the sharks identified in the south-west coast’s False Bay have been re-sighted on the east coast’s Algoa Bay. This finding has important implications for environmental management of the population. The global connections of white shark populations are complex, reflecting a combination of many historical events shaping a species with more than 14 million years of evolution. This includes the closure of the Isthmus of Panama, the narrow strip of land that separated the once connected Atlantic and Pacific Oceans 3.5 millions year ago. Other events, even if isolated, contributed to shape the complex distribution of white sharks population, like the infrequent long-distance migrations that originated in the Mediterranean population. Our study provided further evidence that the modern all white sharks populations originated from an ancestral Indo-Pacific Ocean population and became slowly genetically distinct following a west to east migration pattern. They dispersed in the Atlantic through the once open Isthmus of Panama and then down to South Africa. Interestingly some sharks closely related to South African sharks have been sampled in Australia, but never the other way around. A single divergent group restricted to South Africa only. The divergent South African group interestingly doesn’t connect with any other population sampled to date. The reason for this distinct divergence from the other two groups is currently unknown. There is still a lot to understand about white sharks before effective conservation measures can be put in action. We still don’t know how long they live, where their nursery areas are or even exactly how many there are and how many get killed every year. Based on the genetic results of this study we can only conclude that the low levels of genetic diversity would prevent this species from recovering quickly to a healthier population status. Population genetic theories predict that depletion in genetic diversity causes a reduction in the population’s ability to reproduce successfully. This will inevitably result in a reduction of numbers. In addition, white sharks reproduce slowly since they are not supposed to have any predators. Besides their own survival, white sharks play an extremely important role in the ecosystem. Their extinction would negatively affect the entire ocean.